You probably already know how powerful vitamin C is for your skin. It can fade wrinkles, heal acne, and make skin look years younger. That’s why it’s featured in Système 41’s Vitamin C Serum. But like many of us, vitamin C works even better when it has a partner. One of the best partners for vitamin C is tea extract. Red, green, and white teas all contain compounds that can work together with vitamin C to enhance the skin’s radiance and strength. Tea extracts contain antioxidants that aid in protecting the skin from damage and reduce inflammation. 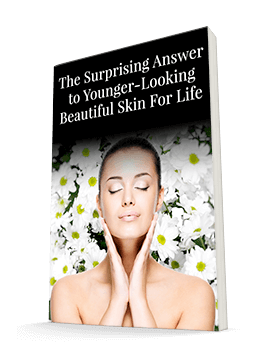 The cumulative effects of oxidative damage are a significant factor in the aging of our skin, so the less damage we sustain, the younger our skin will look. Green tea in particular is beneficial because it contains a phytochemical called epigallocatechin-3-gallate, or EGCG for short. You may recognize EGCG as one of the reasons you are told to drink green tea. Taking it internally also helps to additionally protect the skin from UV damage and from DNA issues. But it turns out that applying green tea topically is beneficial as well. Green tea contains oligomeric proanthocyanidians (OPCs), which help reactivate skin cells damaged by sunlight, pollution, or a poor diet. Plus, it protects against typical signs of aging while making your complexion appear moist and supple. Tea extracts even contain some vitamin C themselves, providing reinforcements for any vitamin C you’re already using to support the skin. These extracts stimulate the skin to build new collagen, which gives you a firm, youthful look. Vitamin C also works to keep connective tissues strong and flexible, helping to avoid sagging. Since green tea is such a good assistant to vitamin C, we included it in the Vitamin C Serum. Vitamin C and green tea work hand-in-hand, alongside a few more powerful ingredients, to give you youthful, radiant skin. Consider it your partner in looking your best!